2018 Juan Carlos Loyola OAM Award Presentation of award to Vince Manno with Carlos Loyola OAM Congratulations to the winner of the 2018 Juan Carlos Loyola Award for longstanding community service which has been presented to Vince Manno. Since 1990 Vince has been an active committee member of the Victoria Police Soccer Club and contributed to its longevity and success. In 2001 Vince founded the community youth initiative known as the Soccer COPPS Program© and has provided over $400,000 of sporting and giveaways to over 11,600 young people. Vince is a strong advocate and driving force, using soccer as a crime prevention and early intervention strategy, for engaging our young people in positive relationships with the police. The Juan Carlos Loyola OAM Award for Longstanding Community Service is an annual award now in its 7th year. 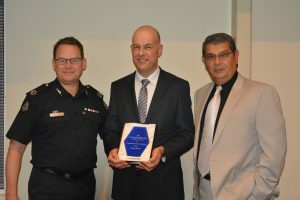 It is presented to a resident of South-East Melbourne who has shown long-term dedication to the local community through their volunteer work. 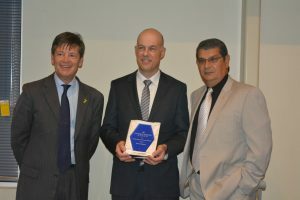 The award is named after Juan Carlos Loyola OAM who has worked tirelessly for more than twenty-five years with the Doveton Special Soccer School.